I begin as I mean to go on, fingers crossed I last! I mention running in these ones! This was the first time I had run this race, and yet again my training had been slightly lacking, however my overall fitness felt good enough to go the distance. I was not expecting to get a PB, and I didn’t. I lived in Leeds for a few years, despite that I still had no idea where the course went, even when looking at the course map. I put that down to the fact that the years I lived in Leeds I was in fact drunk for much of the time – student life of course! So the run was to be a mystery tour, luckily I didn’t need any nav skills! Sunday was promising to be a scorcher, so I delved deep into my sports drawer and dug out my running vest and shorter running tights. As this was of course a road race I ditched the fell running shoes and relied on my faithful Mizuno Wave Rider 9s. I finished compiling my running playlist on Spotify and I even charged up my running watch! I felt nicely prepared equipment wise. 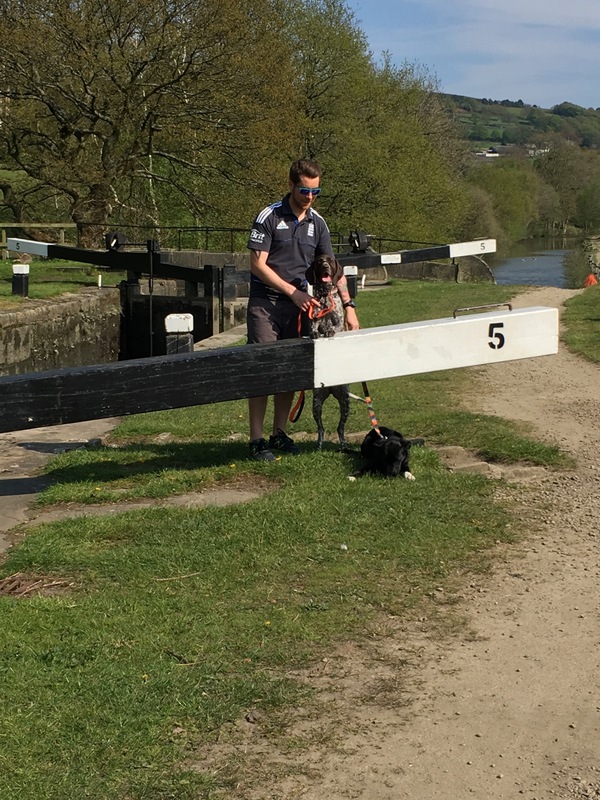 A last minute puppy poo crisis meant that phill had to stay at home just in case Bob exploded, so I had no cheering squad – I was on my own as I knew the girls from work would have mega hangovers and not make it into town, and I don’t blame them – spectating can be pretty boring! I got there in plenty of time so killed time taking selfies and warming up. 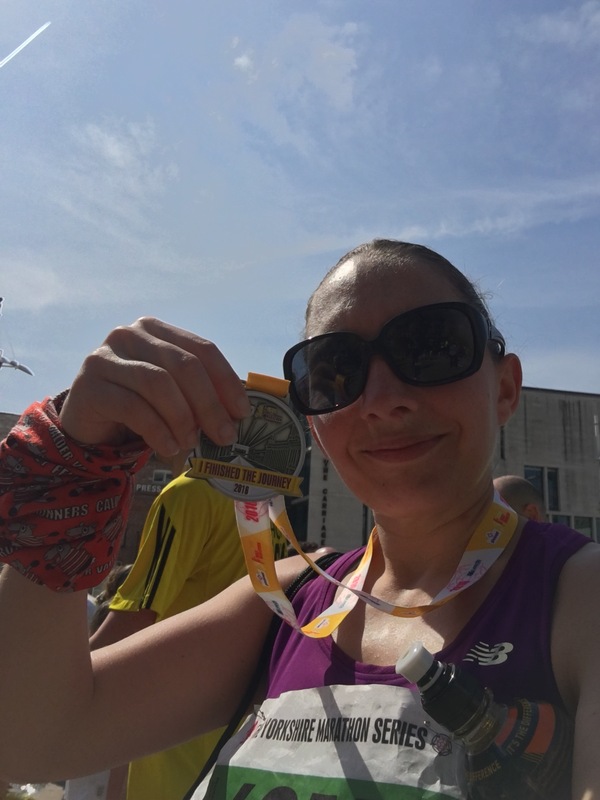 It was a lovely sunny morning, a little too hot for running 13.1 miles, but better sunny than rainy any day. I started well, if a little fast as usual. There were a few sneaky hills, but all runable and nothing like running on the fells. At the halfway point I was feeling good, if a little warm. Support along the course was great, with a few people out with hoses to cool the runners down, which was appreciated. By mile 10 I was starting to tire and get very hot. Especially my feet – my socks were a little too thick. At this point you hit Kirkstall Abbey and whilst this road seems flat it has a slight incline and is a bit of a drag, then for good measure you have an incline to get back into town, and the finish line was also on a slope – cheeky. Secretly I’d hoped I could get close to 2hrs, but I finished in 2hrs 7mins (Strava link here). Initially I was a little disappointed, but I hadn’t trained properly and this was actually my 3rd fastest half marathon, so in the end I’m pretty chuffed. Phill thinks with decent training I should be able to do a 1hr 50mins half – we’ll see. This was a very well organised race, plenty of water stations (I was worried they may run out in the heat), good staggered starts and nice medal and finishers t-shirt. I’d give this one another bash! Recovery was fine, even managed a nice walk out in the afternoon with the dogs. And of course a few celebratory beers. Back in January 2016, hubby and I decided to take part in a race with a difference. 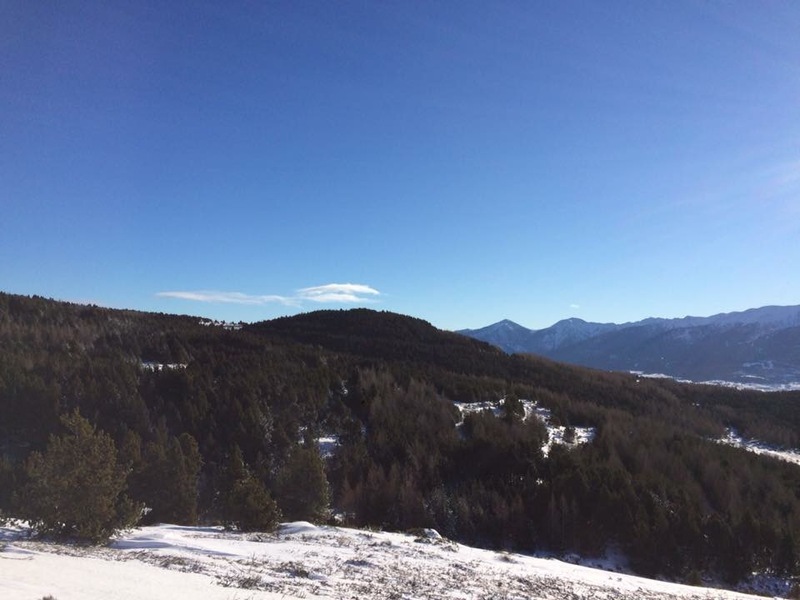 Phill had come across a website for the Trail de Font-Romeu, and someone had also shared a link on the CVFR Facebook page to a B&B that was run by English ex-pats, and who were organising transport to the race – perfect! Decided it didn’t look too bad and promptly signed up. I signed up for the 12km discovery course and hubby went for the 25km Authentique course, almost tempted by the Passion, 40km course. But given the higher altitude, opted for the more sensible option. Pyrenees Haven were offering a weekend package for the race, which included airport and race transfers on a half board basis. Run by a lovely family from Pudsey, and also fell runners, we knew we were onto a winner, and we were not disappointed. It was lovely. They organised for us to have a taster run around a cross country course to get used to the altitude on the afternoon we arrived, arranged race transport and Gary even ran around the course trying to take pictures of us. There was a lovely couple from Wharfedale Harriers also staying at the B&B, so it was nice to make new friends and compare fell running stories. The race itself was great. I wasn’t sure what to expect and was quite nervous, especially as Gary had taken us for a 5km jog out the day before and I had struggled with the deepness of the snow (energy sapping) and the altitude. Then I realised it was because the other 4 were a lot bloody quicker than me and I was trying to keep up. When it came to race day I didn’t need to worry as they were all doing the longer 25km, so I was safe and happy doing the 12km option. One main difference of running in France was that not many people liked to run up hill. Now this is usually an energy saving tactic when fell running, but mainly for the steep stuff, they walked anything! I tried to blend in! The biscuit was well and truly taken when I realised they weren’t overtly keen on running downhill either, so I blew my cover and did some downhill overtaking. As I have stopped wearing my running watch and just relied on my phone to log all my strava runs, judging distance is a nightmare as it has never been my strong point, along with pacing, or in fact any aspect of running. This meant I got to the end and still had a lot left in the tank, so I really need to dust that watch off and start applying myself! The course was good and the weather perfect. I managed to complete the race in 1hr 55mins, which I guess I was pleased with given so many unknowns. But I’d definitely want to go back and try and beat that time. The race was very well organised with a good choice of food and drink at the end (and at the aid station – not really needed for the 12km though). Whilst I filled myself up I overheard the winner of the 25km come in, it was only Sam Watson from Wharfdale Harriers who was staying at the same b&b. I don’t think the French were overly impressed that a foreigner had come over and won their race, but they were very gracious. He got a lovely trophy! Never more apt when fell running! Running up hill is hard! We moved house – Again! I haven’t found a baking club in the North! 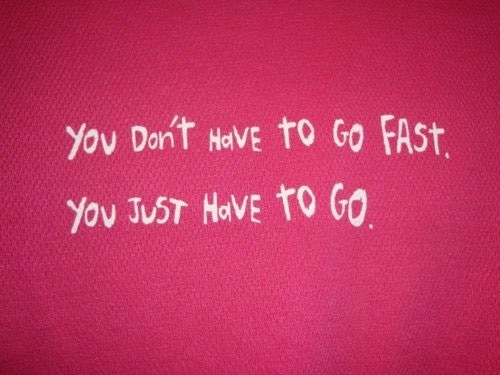 Luckily my inner competitive streak keeps me going with the latter, but even my runs and training are very sporadic. Even when I was running on the lovely flat roads of London I was never going to be fast enough to win anything, but now my new goal is to not coming last. Fell running is a nasty beast. 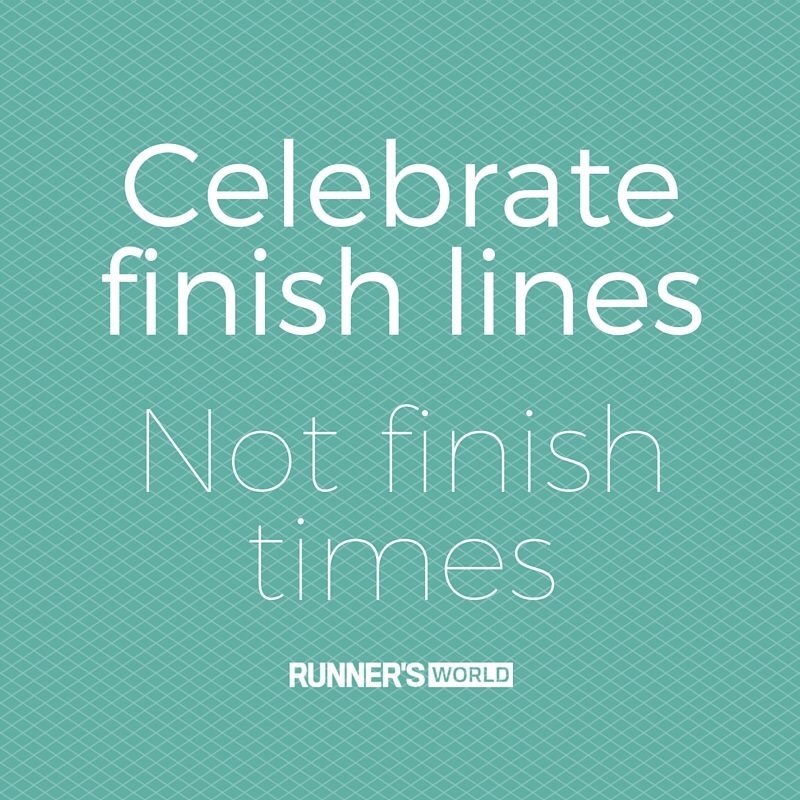 No two runs are the same – even the same route. The weather and terrain can drastically change the conditions and run ability of a course. And of course those pesky hills. I’m lucky if I can run around a whole fell race, usually resorting to a trudge up the hill, and a cautious canter down steep, slippery hills. I miss racing on nice flat tarmac. Having said that, there is a perverse thrill of running through a muddy bog, hoping your shoes follow you. Or the feeling of your lungs wanting to jump out of your throat as you attempt to fast walk up a hill, just to overtake a 70 year old, who will likely beast you on the decent. As I am unlikely to ever run a fell race at a nice average speed of 9 minute miles my goal is to not come last. So far I can claim this victory, even if I am amongst the amazingly fit 60 and 70 year olds, and I did drop out of a particularly long and nasty fell race because I knew I would come last if I carried on. This was Heptonstall fell race and I was pleased to tackle this again this year and actually finish it, and not come last. It was 15 miles with almost 3000ft of climbing so quite an achievement, even without my own silly goals. I’ve joined a lovely local fell running club, Calder Valley Fell Runners, and there is a nice mix of abilities that you can always find someone to run with and encourage you. Unfortunately I don’t get down enough to train due to work and puppies, so this probably hampers my progress. As a nice treat I have decided to enter the Leeds Half Marathon on the 8th May, and I can’t wait to run some nice tarmac miles, with very little hills. Since moving to Yorkshire my other half has embraced many northern past times, such as hiking, growing a beard, driving a landrover, chopping wood, wearing wellies, and what we moved here for, fell running. Some of these I have partaken in too, I’ll leave you to guess which ones. Now I like running (sometimes) as you can see from this blog. But I’m not really keen on mud, hills, bad weather, so boy have I moved to the wrong place. However, I am of the opinion that if I can get the motivation to train in these conditions, then my nice flat Manchester Marathon should be a piece of p*ss (in Harley lame running terms) come April. So, very kindly, the other half arranged for me to go out for a ‘nice’ 8 miler with a friend’s wife from his running club. The day before I had failed miserably at Burnley Parkrun on only my 2nd attempt – passed performance had always had me tracking positively on the ole Parkrun PB front. But damn this northern climate, I was off form! But that could also be the lack of any training whatsoever. I had also failed spectacularly at my 1st personal training session the night before, by almost passing out and puking. Man I must be super unfit! So the thought of unleashing my shitness on new people had me worried. I had no idea of the course, what type of hills we’d climb, speed of my running buddies, or their tolerance of ‘pretenders’. The only good thing on my side was that it wasn’t raining for once. 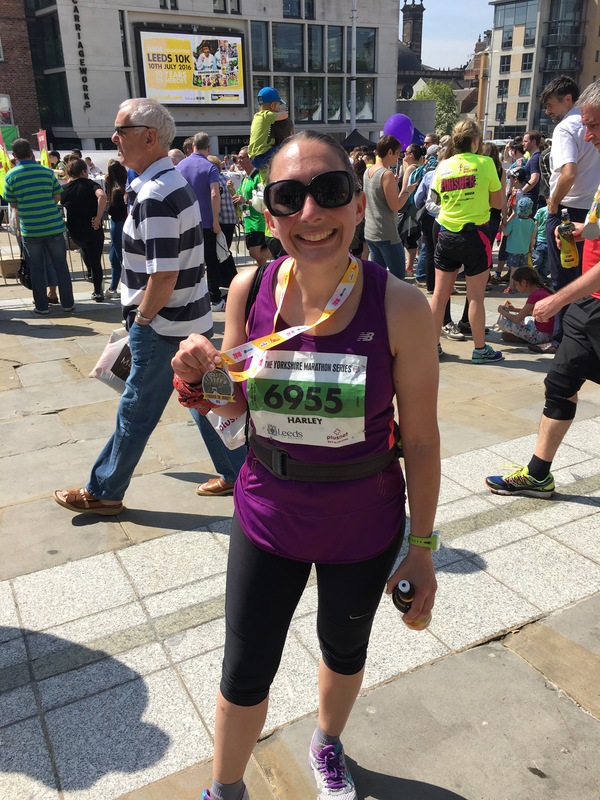 I geared up – never worn so many clothes, especially especially compared sunny Dulwich running, and headed over to meet them. We were going to take a bunch of beginners out for their 1st off road fell run. Yay I thought, thinking back to the nice tame beginners at DPR, and how this may not be as bad as I feared. I have no idea what they feed on round here, but these guys were ace. I decided to take up the sweeper position! I don’t think I ran up one hill! Talk about baptism of fire! But you know what…I loved it! It was tough, but I know it only means I can improve. They were a fab bunch and I’m gonna look forward to slowing them down again in the future. Might even infiltrate the ‘beginners’ course when it starts again. I even didn’t shy away from the mud. Apparent it’s good for the skin! My feet will be beautiful in no time! 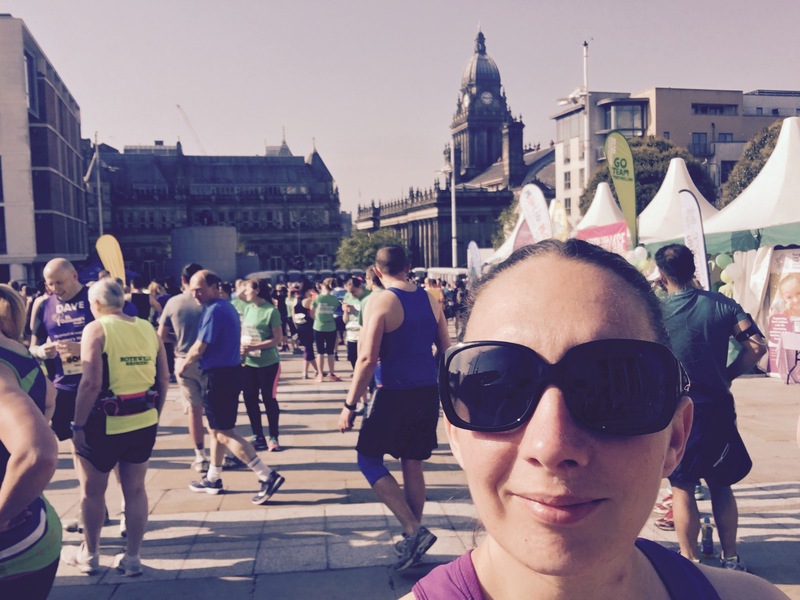 Manchester Marathon here I come…. Yesterday I started my road to my 2nd 26.2 miles with my 1st parkrun since March 2014. We recently moved to Yorkshire so our local Parkrun is now Burnley. As you may have noticed I have an internal competitive streak but not enough motivation to really push myself, so the prospect of running what I anticipated would be my slowest Parkrun yet was not appealing. I foresaw me struggling, walking and being at the back. Now don’t get me wrong the last time I ran wasn’t March 2014. I had done a marathon in April and a couple of half marathons since then, but I’d only run 60 miles in total since April, and sporadically at that. Burnley Parkrun is set at Townley Hall Park and is a nice course, albeit a course with laps in it. But luckily not a lap course where the leaders lap you unless….gulp! I set myself a goal of finishing within 30 mins. That may have been a slightly comfortable target, even my first Parkrun was better than this. My slowest park run was 28.51 at Dulwich back in Feb 2013, but I had eaten a lot this christmas. There was a good turnout running, a great number of volunteers and pacers. I decided just to go at my own pace and set off comfortably. There was a slight uphill and an inevitable downhill. Unfamiliar with the course I wasn’t sure where to reserve energy or go for it. As a result the last large loop was a little tough. Also the finish straight was uphill and this is usually where I dig in and push for a strong finish. Not today. Looking forward to improving on this time and getting PBs each week as I train for the Manchester Marathon. Now, that last one is important as I’ve signed up for the ASICS Manchester Marathon in April, and I’ve hardly run a mile since Big Sur last year. I’ve got podgy, lazy and complacent. I will be fixing that over the next 4 months. I have a target, 4.30, I have a personal trainer, and I have a boat load of hills to build up my strength! Unfortunately I also have wild Yorkshire weather to contend with so training should be fun and bracing!! Moving out of London means no baking club, so my waist line should benefit. I made some lovely friends at Band of Bakers, and I’m sure I’ll continue baking but my blog may end up being more about running. A new job will keep me challenged mentally and I’m looking forward to getting my teeth in the role, and to making a new bunch of friends. The new puppy will also challenge my patience but will be a great companion once she’s big enough to keep me company on runs. 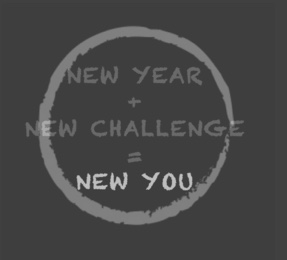 So no booze for January, healthy eating and a manageable fitness regime. Hopefully I can keep to this better than I keep this blog updated. Old Posts – Have a look they might be fun! I'm harder than you think. Tales from an East London kitchen.